Frontotemporal dementia (FTD) is a common dementia in people aged under 65 years [1, 2] characterized by impaired social comportment, apathy, lack of empathy, cognitive decline, and appetite changes with neuropathologic and genetic features overlapping with amyotrophic lateral sclerosis (ALS) in a subset of patients. ALS is a neurodegenerative disorder that, in its most common form, causes both upper and lower motor neuron signs with muscle wasting and a rapid progression to death within 3 to 5 years. These two diseases often coexist, with 22% of ALS patients meeting FTD diagnostic criteria and a greater number (48%) manifesting cognitive or behavioral abnormalities of FTD but not the full syndrome [3, 4]. Conversely, 15% of FTD patients display signs of motor neuron disease or ALS , suggesting that these diseases lay along the same disease spectrum. A family history of dementia is present in about 40% of FTD cases, with an autosomal dominant pattern of inheritance identifiable in 10% of cases . ALS has an autosomal dominant pattern in up to 10% of cases as well . Previously, most of the known genetic causes of FTD were attributed to mutations on chromosome 17, in genes encoding the microtubule associated-protein tau (MAPT)  or progranulin (GRN) [9, 10]. Prior to the discovery of C9ORF72, the most common mutation associated with ALS disease was in superoxide dismutase (SOD1) [11, 12]. Other mutations identified in familial ALS include UBQLN2 , TDP43, FUS, OPTN, and VCP. A variety of prior linkage analysis studies of families in which members have developed FTD, ALS or both (FTD-ALS) in an autosomal dominant inheritance pattern suggested linkage to a region on chromosome 9p [14–22]. A collaborative effort between our group at the University of California, San Francisco (UCSF), researchers at the Mayo Clinic, and the University of British Columbia (UBC) led to the discovery in 2011 that a hexanucleotide repeat expansion in a non-coding region, the promoter or the first intron, of the chromosome 9 open reading frame 72 (C9ORF72) gene was the cause of FTD and ALS in the most strongly linked family (Vancouver San Francisco Mayo-20 (VSM-20) family) to chromosome 9p. Analysis of other autosomal dominant FTD kindreds revealed this mutation to be the most common genetic cause of FTD (12% of familial FTD; 3% of sporadic FTD), ALS (23% of familial ALS; 4% of sporadic ALS) or combined FTD-ALS at each of these institutions [12, 16, 23]. At the same time, another group found the same genetic mutation in a Finnish population with higher prevalence (46% of familial ALS; 21% of sporadic ALS) . In the initial studies, the clinical disease phenotypes associated with this mutation most commonly included FTD, ALS, and FTD-ALS [25–27]. Less frequently, other phenotypes, such as the non-fluent variant of primary progressive aphasia (nfvPPA) and semantic variant of primary progressive aphasia (svPPA), both with and without motor neuron disease, have been observed [12, 28, 29] in addition to Alzheimer's disease . At autopsy, examination of these mutation carriers identified frontotemporal lobar degeneration-TAR DNA binding protein-43 (TDP-43; FTLD-TDP) neuropathology in all. The location, morphology, and distribution of TDP-43 immunoreactive inclusions define the TDP subtype of FTD pathology  and two subtypes, FTLD-TDP type A and type B, have been reported in association with the C9ORF72 mutation [26–32]. Additionally, immunoreactivity to ubiquilin (UBQLN) and p62 (sequestosome 1), proteins involved in cellular protein degradation pathways, as well as an as yet unidentified protein, have been noted in mutation carriers [12, 16, 26–29, 32–35] and have been hypothesized to be signature pathological features of C9ORF72-related disease . The discovery of the C9ORF72 mutation has important treatment implications for patients with FTD. First, this mutation may reveal important mechanistic information about the molecular triggers for FTD and ALS, thus allowing the identification of novel drug targets. In addition, the discovery of C9ORF72 mutations as a cause of FTD may help to resolve some confusing dissociations between two genes that, when mutated, cause ALS but rarely FTD, yet are found at autopsy in the form of insoluble protein deposits in both disorders: TDP-43 and fused in sarcoma (FUS). Since both TDP-43 and FUS are RNA binding proteins, the finding that C9ORF72 expansions have the potential to alter RNA binding protein levels may be particularly important for understanding the biochemical mechanisms underlying FTD-ALS. Specifically, C9ORF72 repeat expansions decrease the levels of TDP-43 or FUS, which could affect RNA transport or processing and may be a key pathophysiological trigger for FTD-ALS. In addition, C9ORF72 mutations could also impair RNA metabolism if the hexanucleotide repeat expansions sequester other nucleic acid binding proteins . Thus, cellular RNA processing and transport mechanisms are likely to be key drug targets for FTD-ALS. Second, since the C9ORF72 mutation is by far the most prevalent cause of FTD and ALS, accounting for 11.7% of familial FTD, 22.5% of familial ALS, and 4% of sporadic ALS , and as much as 46% of familial ALS and 21.1% of sporadic ALS in a Finnish population , a treatment developed for C9ORF72 mutation carriers might eventually find a use in both inherited and sporadic forms of these diseases, potentially benefitting a significant pro-portion of patients with both disorders. Both possibilities are discussed in greater detail below. Targeting the pathological mechanism responsible for C9ORF72-associated FTD and ALS is a logical first step in leveraging this discovery to develop new treatments for both C9ORF72-associated disease as well as other forms of FTD and ALS. Two non-mutually exclusive mechanisms might explain the pathogenesis of C9ORF72-related FTD-ALS. Expanded repeat disorders in untranslated regions or introns generally can cause disease pathogenesis by loss of function due to decreased protein expression, or by toxic gain of function due to inclusion of multiple repeats within DNA or RNA transcripts . The hexanucleotide expansion can occur in the C9ORF72 gene promoter region that binds to transcription regulatory factors. This can lead to decreased C9ORF72 gene transcription and ultimately protein expression. Consistent with this hypothesis, one of the three RNA splice variant mRNAs from C9ORF72 was decreased in mutation carriers compared to non-carriers in two separate studies [23, 37]. Thus, one target for new FTD drugs might be agents that increase C9ORF72 protein levels, or make up for the loss of C9ORF72 protein function. Expanded hexanucleotide repeats in RNA transcripts could result in aberrant splicing or generation of RNA fragments that form nuclear inclusions. These foci could sequester RNA-binding proteins in the nucleus and alter regulation and splicing of other genes. As a result, the C9ORF72 hexanucleotide expansion RNA foci could have multi-systemic effects. Such a sequestration mechanism occurs in other non-coding repeat expansion diseases such as myotonic dystrophy (DM1) and fragile X-associated tremor/ataxia syndrome (FXTAS) [38, 39], which have both neuronal and non-neuronal phenotypes. This suggests that a second target for new FTD therapies would be the repeat expansions themselves or the RNA fragment foci that form as a result of the repeat expansions. A final possibility is that RNA-binding protein sequestration by expanded hexanucleotide repeats and haploinsuciency of C9ORF72 protein both contribute to the disease mechanism and could be targets for therapeutic intervention (Figure 1). Drug development opportunities resulting from the C9ORF72 mutation discovery. The figure shows a general, hypothetical drug development plan with opportunities resulting from the discovery at multiple pre-clinical and clinical development stages. ALS, amyotrophic lateral sclerosis; C9ORF72, chromosome 9 open reading frame 72; FTLD, frontotemporal lobar degeneration; TDP, TAR DNA binding protein. Clues to identifying which compounds might prove efficacious for C9ORF72-related disease can be found by looking at other neurodegenerative disease models with similar repeat expansion pathophysiology. DM1, FXTAS, and several spinocerebellar ataxias have repeat expansions in non-coding regions that may lead to targeted drug discovery efforts or already have these underway . Examining previously tested drugs (both failed and promising) and drug targets in these disorders might provide starting points for C9ORF72. RNA antisense oligonucleotides have been studied in DM1 [41, 42], were tolerated in a phase I clinical trial for SOD1-related ALS, and could be applied in c9FTD/ALS. These oligonucleotides could act to interrupt sequestration of critical proteins by toxic RNA hexanucleotide repeat expansions or potentially alter the transcription or splicing of C9ORF72. Alternatively, the oligonucleotides could disrupt RNA hairpin structures or other steric conformations that are thought to have toxic effects in other repeat expansion mutation diseases [36, 39, 43]. TDP-43 is another attractive drug target in C9ORF72-related FTD/ALS. Although TDP type A and B have been reported, all autopsy studies of C9ORF72 mutation carriers thus far have been noted to have TDP-43 pathology. Even with the variable FTLD-TDP pathology, a compound that increases clearance or inhibits aggregation of TDP-43 protein could be useful in c9FTD/ALS. One compound that does this is methylene blue, which can decrease TDP-43 aggregation in vitro , although, thus far, methylene blue has failed to demonstrate improvements in motor function in TDP-43 mouse models of ALS . Methylene blue may also promote autophagy . Compounds that increase cellular protein turnover via autophagy or the proteasome pathway might also be candidate therapies for C9ORF72-related disease, particularly since there is evidence of accumulation of proteins such as UBQLN and p62 in these cases . Finally, if developed, immunotherapies (vaccines or neutralizing antibodies) targeted towards TDP-43 would be attractive therapies. A variety of such therapies are in development for neurodegenerative diseases with tau, amyloid, and synuclein pathology. In order to determine which mechanism(s) is/are pathogenic, cell-based studies or animal models of C9ORF72-related disease are needed. Transgenic mouse models have been used to study many degenerative diseases, including Alzheimer's disease and ALS, and may ultimately be most useful for developing C9ORF72-targeted therapeutics. In addition, if C9ORF72 homologues exist in Caenorhabditis elegans and Drosophila, these model systems may also be useful for target identification . Induced pluripotent stem cells have also been used to create both patient- and disease-specific cells  in order to better study the pathophysiology . High throughput drug screening using cells from C9ORF72 mutation gene carriers, such as those that we have derived from the VSM-20 family, could be used to screen for potential compounds. When therapeutic interventions are identified, patient-specific cell lines can be used to test the toxicology and potential benefit for that individual patient. Given the heterogeneity of C9ORF72 phenotypes, with both slowly and rapidly progressive forms of disease , use of patient-specific induced pluripotent stem cells may be particularly useful for C9ORF72-related disease. Other potential agents to consider for treatment of c9FTD/ALS are ones already used or in late stage clinical trials in ALS . Considering the pathological, genetic, and phenotypic similarities now known to be shared with FTD, drugs found to be efficacious for ALS might also be expected to benefit individuals with FTD due to TDP-43, particularly those caused by C9ORF72. Riluzole, a neuroprotective agent thought to block voltage-dependent sodium channels on glutamatergic nerve terminals, is the only US Food and Drug Administration-approved drug to treat ALS and has been shown to reduce mortality, though modestly [52–54], and may be worthwhile testing in preclinical C9ORF72 models. Dexpramipexole, an enantiomer of pramipexole, is thought to have anti-inflammatory properties and was recently found to attenuate the decline in function using the ALS Functional Rating Scale-Revised (ALSFRS) in a dose-dependent manner with good tolerability in ALS . Fingolimod, an anti-inflammatory drug used to treat multiple sclerosis in several countries outside the United States, will soon begin phase II clinical trial in ALS  and may also have promise in FTD. Clinical trials of agents that have clearly shown no benefit in ALS, like those with lithium , may also be useful in guiding such therapies away from use in FTD due to C9ORF72. To streamline identification of promising treatments for C9ORF72-related disease, cases from previous ALS clinical trials should be genotyped. Given the high prevalence of the C9ORF72 mutation in ALS, agents that are beneficial for sporadic ALS may also be useful in C9ORF72-associated FTD and FTD-ALS. Such a response might be predicted if post hoc genetic analyses of previous ALS clinical studies showed that C9ORF72 patients clearly benefited from a drug. Even if an overall ALS clinical trial was negative, it remains possible that C9ORF72 carriers could have been a responsive sub-population in whom effects were masked by non-carriers. Similarly, it would be of interest to genotype patients who respond particularly well to a given therapy to assess whether this relates to C9ORF72 gene status. Studying patients who are carriers of the C9ORF72 mutation with particular attention to the genetic and environmental factors that can slow or alter the disease phenotype is another way to learn about the disease mechanism to identify potential drug targets. An example of a slowly progressive FTD (FTD-SP) phenotype of C9ORF72 disease has been described recently . FTD-SP patients have features of FTD, yet have been noted to have minimal atrophy on structural MRI and little to no progression on sequential neuropsychological measures. Identifying the factors that affect the rate of disease progression like those in FTD-SP patients would provide insight into other targets for potential therapies. An important question that has yet to be answered is whether the number of hexanucleotide repeats affects the C9ORF72 phenotype, similar to other repeat expansion disorders. Preliminary studies have found that normal controls have no more than 23 to 30 repeats of the hexanucleotide (GGGGCC), but carriers of the mutated alleles usually have over 60  and as high as 1,600 , although the number of repeats is not easily quantified. It is also likely that other genes exist that modify the C9ORF72 phenotype. For example, in FTLD-TDP caused by progranulin (GRN) mutations, a number of genes and microRNAs have been identified that alter the disease phenotype . The presence of certain TMEM106B single nucleotide polymorphisms was shown to reduce GRN mutation penetrance possibly by modifying progranulin protein levels . TMEM106B could thus be a target for new therapies for patients with GRN mutations, and similarly, genes that modify C9ORF72 protein levels or function would be good targets for drugs in C9ORF72 mutation carriers. Studies such as COHORT-HD (Cooperative Huntington's Observational Research Trial) that seek to identify genetic and environmental factors that modify disease progression are being pursued in other repeat expansion diseases such as Huntington's disease  and suggest that similar efforts should be pursued in c9FTD/ALS. A large study like this, if employed for C9ORF72, could identify both genetic and epigenetic factors that influence the C9ORF72 hexanucleotide expansion phenotype. Potentially, factors such as the number of hexanucleotide repeats, brain atrophy pattern at baseline, or environmental exposures could be used to identify other targets for C9ORF72 disease modifying agents. In preparing for clinical trials on mutation carriers of C9ORF72, a first step would be to use the C9ORF72 genotype as a biomarker for diagnostic inclusion. If the rate of progression of disease is related to the length of repeats, as seen in other repeat expansion diseases like spinocerebellar ataxias and Huntington's disease, this could also help to select certain populations of C9ORF72 mutation carriers who are expected to progress at the same rate. To determine if a particular agent is modifying the course of C9ORF72 disease or delaying expression of the disease phenotype in a mutation carrier, a biomarker that accurately captures disease progression would be particularly helpful. A cure for C9ORF72-related disease is more likely if a disease modifying treatment can be initiated early in the course of the disease, ideally before the onset of disease. By following the model of other groups that study autosomal dominant forms of dementia, such as the Dominantly Inherited Alzheimer Network (DIAN), future researchers can emulate methods to study the effect of the C9ORF72 mutation in presymptomatic mutation carriers. DIAN is a clinical research network that studies the presymptomatic events that occur in autosomal dominant Alzheimer's disease gene (mainly presenilin 1 and amyloid precursor protein) carriers to learn about the disease. DIAN has identified changes in neuroimaging and fluid biomarkers that precede the development of AD in these cases, often by 15 years or more. Biomarkers will be crucial to gauge the efficacy of therapeutic agents in clinical trials of disease modifying agents initiated before the patient displays clinically manifest disease. Such a presymptomatic 'prevention' trial is currently planned for DIAN as well as another similar Alzheimer's disease initiative called the Alzheimer's Disease Prevention Initiative. Once biomarkers that capture C9ORF72 disease progression are developed (one possibility might be cerebrospinal fluid TDP-43 measurements), similar C9ORF72 prevention clinical trials might be considered. The discovery of the hexanucleotide repeat expansion in the C9ORF72 gene is a major step forward in understanding the pathophysiology of the FTD/ALS spectrum of diseases. With this information, the time is ripe for developing treatments that target specific C9ORF72-associated disease mechanisms. Moreover, the link between various inherited neurodegenerative diseases like FXTAS, DM1, spinocerebellar ataxias, and FTD is becoming stronger as more is learned about the pathogenic mechanisms of nucleotide expansion repeat diseases. A possible common mechanism for all FTLD-TDP diseases involving RNA processing abnormalities could also facilitate the identification of novel therapeutic agents. 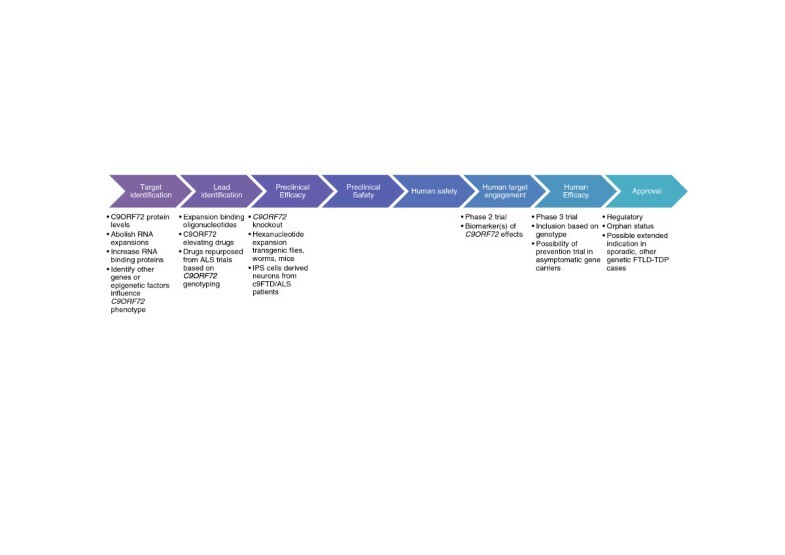 In order to achieve the goals of finding a disease-modifying agent for C9ORF72 FTD/ALS, an appropriate biomarker of disease progression or severity must be identified to be used in human pharmacodynamics and efficacy studies. For example, if TDP-43 is the drug target, then finding an in vivo tool for measuring the burden of pathology, such as a cerebrospinal fluid or imaging biomarker, might be necessary. Likewise, if raising disease-relevant mRNA levels is the goal of a potential compound, it is important to demonstrate that the RNA levels change with disease. Measuring cerebrospinal or plasma RNA levels might be one way to demonstrate such target engagement in human subjects. Future clinical trials could also use measurements of such levels as a surrogate endpoint of efficacy. Further research is required before specific C9ORF72- related compounds can be developed and tested in humans, but the discovery of the C9ORF72 mutation suggests that an important pathophysiological mechanism involves FTLD-TDP RNA processing. This finding may lead to new therapies for FTD, ALS, and possibly other repeat expansion degenerative disorders. Vancouver San Francisco Mayo-20 family. AB is funded by NIH grants R01AG038791, R01AG031278, the John Douglas French Foundation, Alzheimer's Drug Discovery Foundation, the Association for Frontotemporal Degeneration, the Silicon Valley Foundation, the Agouron Institute, the Tau Research Consortium and the Hellman Family Foundation. SJS declares no competing interests. AB has been a consultant for Bristol Myers Squibb, Genentech, Plexikkon, Phloronol, Envivo and TauRx and receives research support from Allon Therapeutics, Bristol Myers Squibb, Janssen, Forest, Pfizer and Genentech.